The splendors of an Indian Maharaja’s court is the stuff of legend that you may have heard or read in books. Ever wondered how they lead their lives? What jewels or clothes they bought? Or, who designed their clothes and jewels? Or, what artwork they collected? There is a book that takes you behind the scenes and opens up the treasure chests of the various maharajas and maharanis of pre-Independent India. India became independent on August 15, 1947. 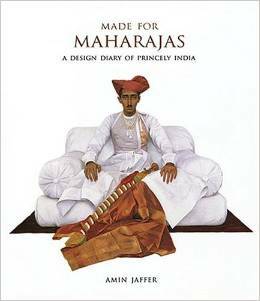 Dr. Amin Jaffer‘s book Made For Maharajas A Design Diary of Princely India (Vendome Press, 2006) takes us on a splendid journey of the lifestyle of the rich and famous Indian maharajas and maharanis from 1857 till 1947. And what a treasure trove these kings and queens amassed over the years. Europe was their preferred shopping destination. The well-heeled Indian elite rank among the early patrons of famous designer houses like Cartier, Boucheron, Van Cleef & Arpels, Louis Vuitton, Ferragamo, and others. And now more than 160 years later the same clutch of European design houses are back in India courting the rich and famous with their dazzling array of jewels, watches, bags, clothes and shoes. What makes Dr. Jaffer’s book interesting is the reproduction of receipts, and the stories of how the representative of the various design houses courted their Indian clients. Did you know that to date Cartier’s highest commission came from a sales transaction to the Maharaja of Patiala points out Dr. Jaffer. The design book is filled with stories about the lifestyle of Rani Molly of Pudukkotai; Yashwant Rao Holkar-II of Indore; Maharaja of Kapurthala; Maharaja of Patiala and numerous other Indian princes and princesses. Dr. Jaffer is International Director of Asian Art at Christies. This interview was originally recorded in 2006 when Dr. Jaffer was visiting Manhattan, New York.